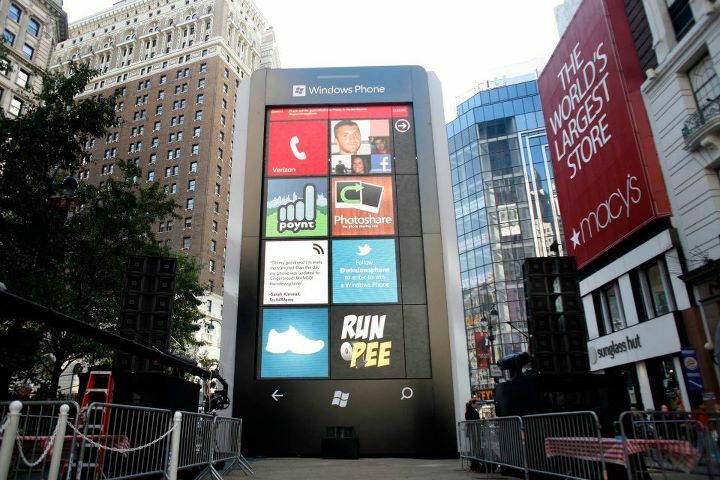 On Monday, Microsoft decided to build a giant 6-story Windows phone in the middle of NYC’s Herald Square. The big Windows phone replica, 150 times the size of the real thing, was a marketing ploy to herald the launch of the company’s new 4G lineup from T-mobile and AT&T which includes the HTC Radar, the Samsung Focus S, the Samsung Focus Flash and the HTC Titan. The celebration in New York City, hinted at last week as a “big, big surprise”, kicked off around noon at Herald Square, close to the Empire State Building. 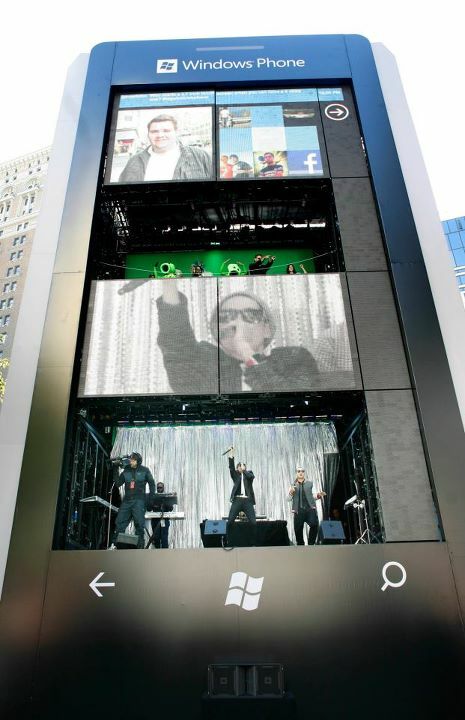 The Big Windows Phone event featured live performances and digital entertainment which was projected onto the LED screens that made up the mock Windows Phone 7 user interface. There were Plants vs Zombies and Fruit Ninjas performances, demonstrations, music and even an impromptu marriage proposal. Everyone that bought a phone was g ive a $25 prepaid card for the Windows Phone Marketplace. Along with the official announcement of the four new phones by Microsoft’s Andy Lees, Spotify announced that its service would finally be available for the Windows Phone 7. The Windows Phone touted the ability to browse and play friend’s playlists, top track and artists; play music and change tracks while the phone is locked or while running other apps; and pin playlists as Live titles on the Start screen for easy access.The Spotify app was promised to be available for download later on today. There’s no word on how long the big Windows phone will stay up, though there’s been some whisper that it might be taken down tonight. If you’re in NYC check it out while/if you still can; if you can’t make it you’ll have to console yourself with this video the Windows team blog released of the supersized marketing stunt being constructed. Funny how 6 stories looks like 3 on camera.